“Dewey, it’s time to wake up and smell the day.” Hmmm, by now I should be used to smelling the day, but Mom likes to remind me every so often. The sound of her motherly voice traveling up the stairs into my room to wake me, feels like a gentle touch on my shoulder. Saturday mornings always seems kinda special. The smell of breakfast traveling throughout the house as the warm morning sun enters through the window at the foot of my bed. The birds singing outside my window confirming it’s time to rise and shine, as Grandpa Does would say. Saturdays can sometimes be tough for kids my age; parents all over the world working on lists of Saturday house chores before day break. That every weekend stuff and sometimes new stuff they would add to the list of things their kids must do before they even think about going outside. I have to wonder, could this be the reason why parents have kids? For the most part, I do love Saturdays because of no school, but mostly because I may have a game or two that sometimes gets me out of my Saturday chores. Needless to say, that only works if Mom forgets my schedule. Otherwise, I would have to wakeup a lot earlier to do chores. Oh my god, just thinking about chores already makes me want to stay in bed. “I’m coming, Mom!” I call out, as I slowly drag myself out of bed one leg hesitantly dangling over the edge. My flip flops waiting below, like a cowboy’s dependable horse waiting to be mounted. “Good morning, Mom,” I reply, using my grouchy voice act, sleep still in my eyes. I slowly stroll into the kitchen dragging my flip flops along the floor. I drop into my usual chair at the kitchen table, like I’ve done thousands of times before, trying to get Mom to turn and look at my facial expression. The look of, ‘I’m not in the mood to do chores’ ingrained in my face. She doesn’t even turn around, as if she was already expecting my act. All my years, I’ve always wondered about that ‘mother’s wit’ thing. Is there such a thing called ‘kid’s wit?’ Because I could use some. “Good morning, Dewey,“ says Mom. I continued starring at the back of my mother’s head, trying to read her mind, anticipating her next words. The expression on my face, priceless! Here it comes, the world is about to drastically move in slow motion, like a last second shot to win my basketball game. ‘Ugh’, my insides screaming out, wishing I was back in the comforts of my bed. I’m almost certain, whoever invented the idea of chores could not have ever been a kid. “See if you can get some of your friends to help,” Mom adds. Now, that’s a novel idea! I quickly sit up in my chair, as if a great thought just jumped into my head. I’ll call Big Bang and Trevor to see if they can help me with my chores. Big Bang should be finished with his music lessons by now and Trevor…well, he should be done combing his hair by now too. I always wondered about my friends. How Big Bang gets up early in the morning just to practice playing his music and Trevor, he starts combing his hair early in the morning, as if he’s about to be called to star in his own Trevor Sparkz Action Movie. He even says his name like a movie star. ‘Trevor, with a slight pause, Trevor Sparkz’. Thinking about Trevor, I wonder, if only I was that cool. Now, sports! Sports are worth getting up early for. If it was ever possible, I would play sports 24 hours a day. Well, maybe 18 hours. I still have to get some sleep and do my homework, you know. Basketball, soccer, tennis, baseball, golf like Tiger…I began getting excited…my mind wondering off day dreaming; I was sitting in my Dad’s car waiting for him to take me to my game. “DEWEY!” My mother’s voice calls out, breaking up another great sports moment. “Okay Mom, Big Bang and Trevor are coming over to help me, but what am I going to do with all that stuff?” I asked my mother, as if she was responsible for the messy garage. An hour or so went by before Trevor and Big Bang made it to my house. After a bit of small talk, we began cleaning out the garage. Dust was all over the place. Big Bang was amazed at all the different sports things. “Where did you get all this sports equipment?” he asked me. With a casual smile, my mind was in another place…again, thinking about the Hawk baseball glove I always wanted. My most favorite baseball player, the Hawk is the best in the whole world. I slowly looked over at Big Bang and replied, “My Dad would always bring different sports stuff home ever since I was a baby,” I answered, as we continued empting the garage onto the front yard. There was so much stuff, even to my surprise. “Dad loved sports,” I finished saying with a low voice, looking sorta sad. Trevor looked my way but didn’t say anything. I began thinking, how in the world am I going to get people to my yard sale? “Should we call all of our friends?” I asked Trevor, not really expecting an answer. I wasn’t even sure I had enough friends. Suddenly, I jumped up, “I know what we can do!” I yelled at the top of my lungs, looking crazy. “We can do jumping jacks. This will get people’s attention!” I excitedly said, my head spinning in every direction. I began doing jumping jacks in my front yard. I motioned over to my friends to join in. Trevor and Big Bang didn’t look happy with the idea, but they joined in with me like the great friends they are. Neighbors and passersby began looking to see what all the excitement was about. I didn’t realize a garage sale could be so busy. The crowd began to grow, I had to call in reinforcements. My friends Fussie Fran, Shy Anna and Cindi Joy came to the rescue. Of course, they felt it needed a ladies touch. Mom pitched in too, bringing me and my friends some badly needed refreshments. People were coming from all over Doseville. My old sports stuff began disappearing from the front yard, while my other friends watched from my bedroom window. “Ugh, look at my nails!” Cindi Joy blurts out. Looking hard over her hands, “Dewey, next time clean your things before you call for my help. My nails look awful now,” she says looking furious. “Dewey Does, you have so many basketballs. May I borrow one?” No one really knows this, but basketball is Shy Annda’s favorite sport. She’s really good at it. “Yes, you may take one,” I told her. I always liked the way Shy Annda says my whole name. I guess that’s the way they speak in foreign countries. It was a long Saturday, like a game going into triple overtime. One of those days where it felt like it was never going to end; maybe I didn’t really want the day to end. My friends and I gave 110 percent effort and working together, we sold all of my old sports stuff. I was so excited, I had earned enough to get the Hawk baseball glove and also treat my friends to ice cream at the Doseville Ice Cream Parlor. Finally, at the end of the day I found myself thinking that chores are not so bad after all, especially when you have great friends to lend a helping hand. And hey, Mom is able to put the car in the garage…at least for now. This story can a have a major impact on kids lives. Reading about life lessons,and kids chores ,and responsibilities is so important for the children of today because they have so many bad habits that only create problems as they get older. Dewey Does is a positive role model! Awww, remind me of my days growing up. Just love reading and sharing Dewey’s stories/adventures with my kids. Introduce your children to a great role model! Dewey Does is definitely what our children need more of. Dewey Does is with out a doubt what our children need more of. My grand kids do not like doing chores, but stories like this one encourages creativity and shows kids that doing chores can be fun and profitable. 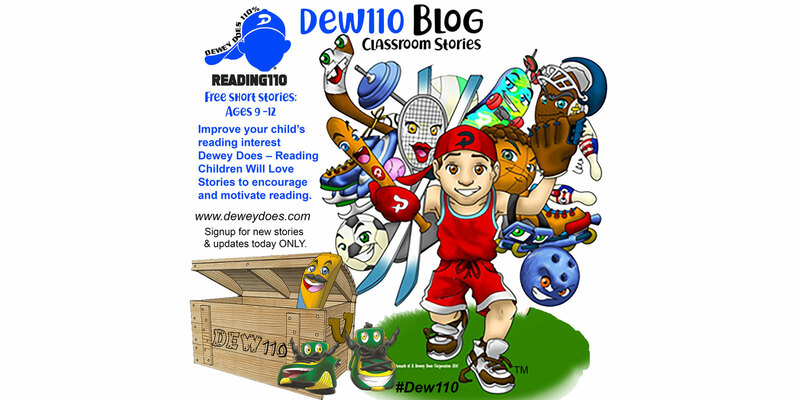 Thanks Dewey for another great story!